Algoma Central is a interesting little Canadian shipper and real estate operator with hidden assets and a profitable market niche. Founded in 1899, Algoma Central grew out of what was once the Algoma Central Railway and is controlled by one man, Henry N. R. Jackman. Algoma, located in Sault Ste. Marie, Ontario, operates four different business units. Domestic Shipping – Algoma owns a fleet of dry bulk carriers that operate in the Great Lakes and Canada’s eastern seaboard. These ships transport dry bulk commodities as well as liquid petroleum products. Algoma has begun a program to replace older ships with new, technologically-advanced vessels. The first of eight of these, the Algoma Equinox, was delivered in September, 2013. For reporting purposes, Algoma separates the results of the dry bulk and tanker fleets. Ocean Shipping – Algoma has a partial interest in four self-unloading carriers, direct ownership of two more and direct ownership of a tanker. The main cargo for these ocean-going ships is coal, crushed aggregate and gypsum. Algoma outsources the management of these ships to other firms with expertise in ocean shipping. Ship Repair – Algoma owns a ship repair facility located in Port Colborne, Ontario, on Lake Erie. Algoma does not report the results of the facility separately. Real Estate – Algoma Central owns 1.3 million square feet of commercial real estate in the Sault Ste. Marie, St. Catharines and Waterloo, Ontario areas. These properties include a hotel, a mall and several office buildings. Occupancy is strong and the properties have substantial value. Though the shipping industry is cyclical, Algoma Central has been consistently profitable. The great lakes shipping industry is a small and specialized segment of the global shipping complex, and has been somewhat sheltered from effects of over-building and massive rate fluctuations that have plagued the world dry bulk and tanker markets. A few things become apparent when surveying these results. First, Algoma is not a rapid growth organization. While not the disaster that global dry bulk and tanker shipping has been since 2008, the Great Lakes shipping market is a slow-growth market. Second, Algoma Central is capital intensive. For the twelve trailing months, the company recorded $46 million in depreciation, or 8.8% of revenues. Capital intensive companies are not necessarily poor investments, but their large capital needs make capital allocation policy even more important. Investors must be able to trust management to make sound investments in fixed assets and anticipate business cycles. Because Algoma Central has multiple lines of business with unique economics, an examination of each segment is due. For cyclical industries like shipping, looking at only the most recent results can paint a false picture of profitability. Using long-term returns on assets to estimate normalized profitability can give a better idea of a business line’s economic potential. First, we’ll tackle the company’s largest segment by revenues and assets, domestic dry-bulk. Here are figures for the segment beginning in 2005, the year that Algoma changed to its current segment reporting structure. Note: Algoma has undertaken a series of joint venture consolidations and other corporate actions resulting in restating past results. I have used results as of the year they were published, without adjusting for restatements. Clearly, the domestic dry-bulk segment is deeply cyclical. From 2004 to 2012, the company’s EBIT yield on average fixed assets employed averaged 8.91%, ranging from a high of 18.56% in 2007 to a low of -0.99% just two years later. Since the period included the most severe recession since the Great Depression itself, the average EBIT yield may be understated. However, the figure remains a useful and conservative estimate of normalized return on assets for the segment. Algoma’s second-largest shipping business is its product tankers operation. Since 2005, the product tanker segment’s profitability has sunk to the mid single-digits, even as Algoma tripled its investment in the segment. For the whole time period, EBIT yield averaged 8.60%, though the average was only 4.49% from 2008 on. Despite this period of low returns, there are some reasons to believe the segment can produce an average EBIT yield greater than it has averaged in recent years. 2012 results were greatly affected by legal fees related to canceled ship orders. Absent these charges, the EBIT yield on average fixed assets would have been greater than 6.5%. Disregarding the mid-crisis years of 2009 and 2010 and assuming 2011 and 2012 results are more typical, a 6.00% normalized EBIT yield is a fair and conservative estimate of normalized profitability. Algoma Central’s ocean shipping is its smallest shipping segment, but by far its most profitable. The ocean shipping segment leaves the others in the dust with an average EBIT yield of 17.28% over the last eight years. Once again assuming the poor 2009 result was an anomaly, I believe an 18.00% EBIT yield is a reasonable estimate for the segment’s long-term normalized profitability. Having estimated the productivity of each segment, the next step is to project EBIT based on the assets of each segment. Based on my conservative estimates of shipping segment profitability, Algoma’s normalized EBIT from these business lines is $59.40 million, an EBIT yield of 9.03% on fixed assets employed. The actual EBIT yield produced by these assets in the twelve trailing months was just under 8.00%, indicating that Algoma’s shipping assets are currently under-earning compared to projected long-term averages. Luckily, estimating the value of Algoma’s real estate assets is a simple process. We could arduously calculate net operating income and determine cap rates, or we could simply use the fair value that the company has provided in its 2012 annual report: $165 million. This figure is $93 million higher than book value and represents one of the company’s hidden assets. Algoma’s balance sheet holds $138.74 million in cash and equivalents, but this amount is under-stated by $41.70 million due to the company’s other hidden asset: refunds received from two Chinese banks on canceled ship orders. These refunds represented down payments on three tanker ships originally ordered in 2007. When Algoma canceled the orders in 2010 based on excessive delivery delays, the Chinese builders claimed the cancellations were invalid and refused to return the deposits. The matter went to arbitration and a London tribunal ruled in Algoma’s favor in April and UK commercial courts denied the builders appeal and Algoma received $41.70 million at the very end of 2013. This figure does not yet appear on Algoma’s balance sheet beyond a $33.94 “recoverable vessel deposits” entry. Including the refunded deposit, Algoma’s total cash is $180.44 million. Algoma’s debt and dividends payable totals $226.81 million. Its pension deficit is $18.32 million. The company’s net debt and pensions is $64.69 million. Algoma Central’s market capitalization is $610.92 million CAD. By determining enterprise value and backing out the real estate value, the market’s valuation of Algoma’s shipping operations can be seen. 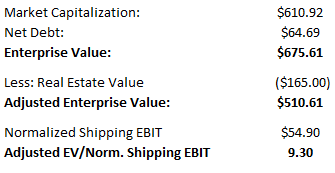 At 9.30x normalized shipping EBIT, Algoma looks…..fairly valued. Of course, it is possible that my estimate of long-term EBIT yield is too conservative since it includes a period of near economic meltdown. On the other hand, conservatism is every value investor’s friend. I’d rather invest in something that trades at a discount to conservatively estimated fair value than make aggressive assumptions and hope I was right. Unless Great Lakes shipping demand picks up dramatically in the short-term, Algoma seems likely to provide average returns. I’d certainly rather hold Algoma than any of the world’s many over-leveraged, unprofitable shippers, but I’d much rather wait for the next time Algoma trades at a mid-single digits multiple of normalized EBIT. I hope readers who primarily drop by to read about dirt cheap stocks are not disappointed by the conclusion. (I think I have profiled enough of those to earn an indulgence post or several!) In my view, there is always something to be learned from researching a stock, even when the company turns out to be fairly or even richly valued. For instance, in the course of researching Algoma I learned a great deal about the various classes of ships that transport commodities up and down the Saint Lawrence Seaway, about the various operating models that shippers in that market use, and even something of the economic history and present situation of the Sault Ste. Marie area. All useful facts for a value investor to squirrel away. Much of success in investing is simply learning as much as possible about industries and economies and then using that knowledge to better perceive value. This was a great post, really a great post. It has learned me a thing or two about valuing companies. Like using for capital intensive companies a ROA approach. This post also made me look at other companies and found an interesting one in Orient paper inc (ONP) US listed. It’s a Chinese paper company that imports paper trash and uses local paper trash for manufacturing of paper product. I found the company after looking for shipment companies, I saw that nine dragon holdings had a deal with a other company(It ships paper to China). So I started looking at paper companies and found ONP. Better,or perhaps just take it down if that is all what Algoma can afford. Algoma is a really interesting company and I completely understand being proud of it. The stock is looking cheap at these levels.